"I think this new website is a great way to showcase not only our job openings, but also the culture of success that our employees have built," said Walter Ledda, Morgan Drexen CEO. Morgan Drexen Integrated Systems is planting a new “help wanted” sign on the internet. MorganDrexen.jobs is a website devoted to highlighting available positions at Morgan Drexen, as well as providing a glimpse into the corporate and social culture at the Costa Mesa-based company. Currently, the site lists available positions in 8 different departments including Credit Settlement Clerk, Legal Intake Specialist, and Settlement Officer. “Not only did we endure the worst recession in modern times, we thrived,” said Walter Ledda, CEO of Morgan Drexen. The company, which began with fewer than 10 employees in 2007, now employs more than 300. MorganDrexen.jobs features five sections: Job Opportunities, Our Culture, Video, Benefits, and Contact Information. The “Our Culture” and “Video” pages serve as virtual windows into the fast-paced and fun-filled atmosphere at Morgan Drexen. The video page shows workers taking part in employee appreciation events, employee awards ceremonies, and company charity events. Visual Design Director Steve Schebesch says he had a specific goal in mind when he designed the website. MorganDrexen.jobs also highlights the company’s benefits options, a major concern for job seekers across the country. Eligible employees have access to traditional benefits including medical, dental and vision coverage. They can also take advantage of less traditional benefits like theme park discounts, a wellness program and, if your pet hamster is a little under the weather, pet insurance. Morgan Drexen (http://www.morgandrexen.com) provides integrated software systems and administrative support services to businesses nationwide. Founded in 2007, the company specializes in developing back-office efficiencies for small and medium-sized law firms. Morgan Drexen’s proprietary MDIS software improves workflow through the use of automated document management. In addition to computer technology, Morgan Drexen provides law firms and other businesses with marketing, marketing support, call centers, outsourced litigation support, databases, work-product retrieval systems and cloud-computing platforms facilitated by the company’s outsourced support staff. 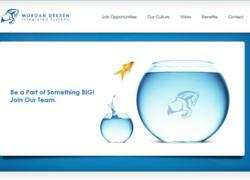 Morgan Drexen employs more than 300 professionals out of its headquarters in Costa Mesa, CA.